The front light in this set comes with a, highly-competitive, 700 lumen output to give you more than sufficient illumination for your commute or dawn and dusk training sessions. With a Maximum Optical Reflection lens the light produces side visibility to ensure your safety from every angle. The front light comes with 8 different modes that you can choose from dependent on your environment or battery life. With a huge output, for a rear light, of 300 lumens the Strip Drive Pro will give you maximum lighting to issue intense illumination which will help you stay safe on urban roads. With a Maximum Optimal Reflection lens the light is also equipped with giving you 180-degrees of visibility which, paired with the front light, will keep you fully seen from every angle. The light is highly efficient both in the evening and during day light hours. 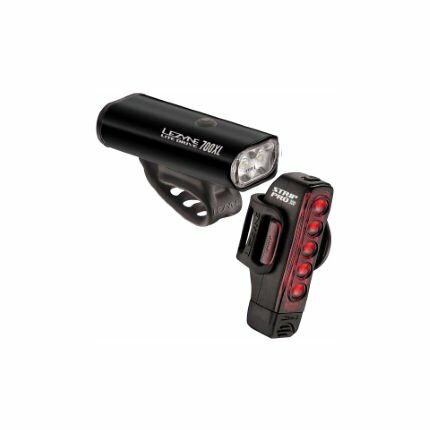 The rear Light comes with 11 different modes to suit multiple different conditions.